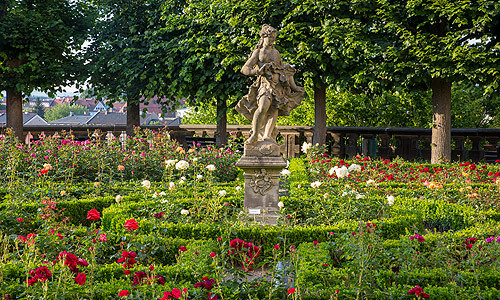 In the 16th century there was a Renaissance garden on the site of the present Rose Garden with rectangular sections divided by paths and two fountains. A shell grotto and a summer house were added later. 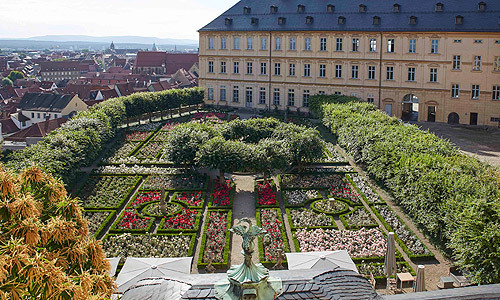 In 1733, under Prince-Bishop Friedrich Carl von Schönborn (r. 1729-1746), this was converted from plans by the famous architect Balthasar Neumann (1687-1753) into a Baroque garden, with the addition of a raised terrace. The present basic structure of the garden with its central fountain originates from the alterations that were begun in the year 1755. After the whole garden had been remade on one level, an axial system of paths and circular flowerbeds was laid out. The Rococo garden pavilion that was built in 1756/57, probably from designs by Michael Küchel (1703-1769), is an attractive architectural feature that today serves as a café. 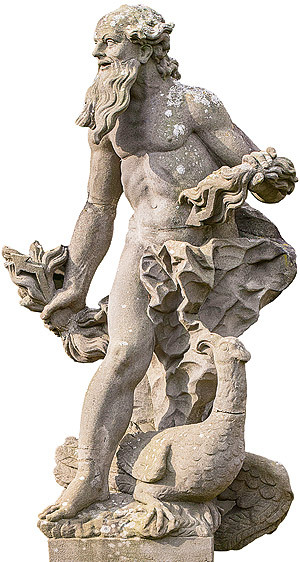 The Bamberg court sculptor Ferdinand Tietz (1708-1777) created the sculptures decorating the garden. The figures that have been preserved are of putti and the Roman gods Jupiter, Juno, Apollo, Diana, Neptune, Ceres, Mercury and Venus. From 1913 to 1929 the sandstone sculptures made by Tietz in 1760/61 were replaced with copies to protect them from exposure to the elements. The originals are now kept in the New Residence in Bamberg. After the Prince-Bishopric of Bamberg was incorporated into the Bavarian kingdom, Duke Wilhelm in Bayern (1752-1837) and his wife Maria Anna (1753-1824) lived in the New Residence in Bamberg. 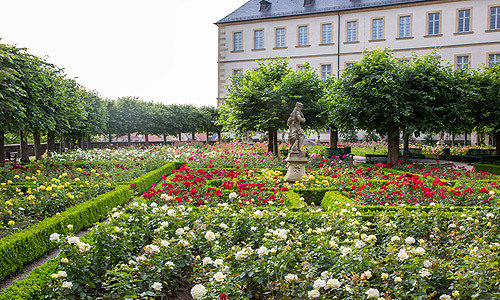 During this period the garden was turned into a private »cabinet garden« with flowerbeds containing, among other flowers, 500 rosebushes. 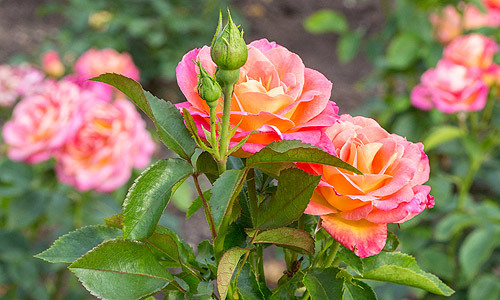 By the end of the 19th century it had »over 3000 rose plants of around 500 selected fine varieties«, making it an early rosarium, a garden where various species and varieties of rose are collected. 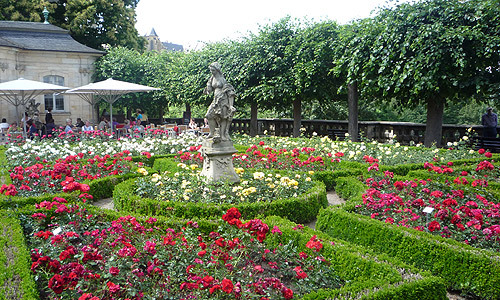 Although it was somewhat modified and replanted in the years 1955 and 1968/69 it has remained a rose garden. Today the beds edged with low box hedges contain around 4,500 rosebushes of 50 different varieties. A fountain basin surrounded by clipped linden trees is located at the intersection of the paths in the centre of the garden. The north side of the garden is bordered by linden trees and the south side along the courtyard wall primarily by hornbeams, a few linden trees and elms. 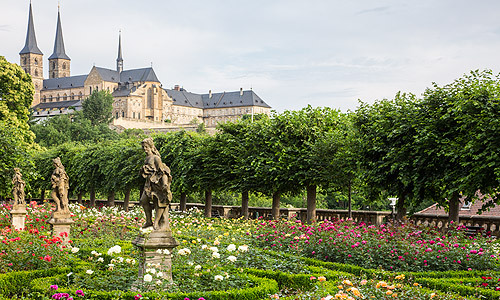 From the balustrade of the Rose Garden there is a splendid view of the old town of Bamberg and the Michaelsberg with the former Benedictine monastery.